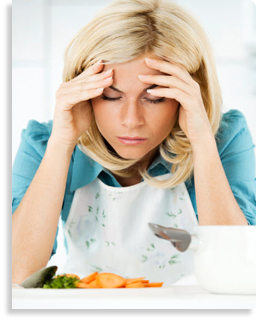 Sinus pressure pain and a stuffy, congested nose are signs of the beginning of a cold or seasonal allergies. Nasal congestion can be responsible for a host of cold and flu symptoms, from sinus headaches to post nasal drip and sore throats. When resting isn’t an option, you can get relief from nasal congestion and sinus pain with Contac® Cold + Flu. Still, it helps to know what you’re dealing with, to help determine which Contac® Cold + Flu formulation is right for you. The stuffy feeling you experience when you’re sick or allergic is a result of irritated nasal passages that become inflamed, due either to viral infection or inhalation of an allergen. Your immune response then produces mucus as a way of flushing out whatever is causing the irritation. Because swelling prevents drainage, this mucus in your nose and sinus passages can form ‘crusts’ that block sinus drainage and may trap viruses and other particles. This is another reason your kids can blow their little noses over and over, without clearing that “stuffy” feeling. Nasal congestion causes sinus pain as a result of the swollen sinuses putting pressure on the sensitive areas around the eyes, forehead, nose and over the teeth. Sinus pain due to nasal congestion is worst in the morning and when you bend over, and is responsible for those terrible sinus headaches. Phenylephrine, found in Contac® Cold + Flu, helps reduce the swelling in your nasal passages and ease the stuffiness and sinus pressure, while acetaminophen (also in Contac® Cold + Flu) can help ease the pain caused by sinus pressure. Although people think that dry air or nasal sprays might help clear up a relentlessly runny nose, they can actually have the opposite effect. Drying out the membranes will eventually irritate them more. Stay hydrated! Fluids will thin out your mucus and may help prevent your sinuses from getting blocked up. Take long showers or carefully breathe in steam from a pot on the stove. Elevate your head in bed at night to facilitate draining and make breathing more comfortable. 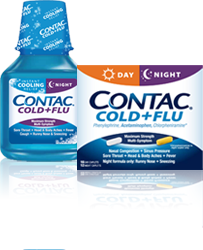 Contac® Cold + Flu is an essential tool in relieving the many symptoms associated with nasal congestion. Because it’s a multi-symptom and maximum strength OTC medication, its combination of decongestant, pain-reliever and fever reducer can effectively control your symptoms.